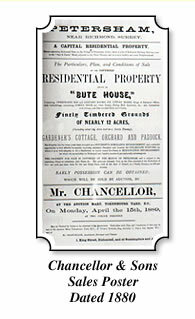 The first known report of the 'Chancellor' family being involved in estate agency is in 1855 when Edwin Chancellor acquired the existing auctioneers practice, which had originally been established in 1807 at No 1 King Street, Richmond, and with his brother Albert, they continued the practise as Auctioneers and Surveyors. Later, around 1896 Albert Chancellor's two sons Beresford and Alginon joined the Partnership. An advertisement in the Estates Gazette from 1896 showed Chancellor & Sons as having offices at 51 Pall Mall London, Ascot, Sunningdale and still at Kings Street, Richmond. In 1911 Albert Chancellor died, and according to the Richmond and Twickenham Times "the business of Chartered Surveyors, Valuers and Estate Agents carried on by Albert Chancellor at Richmond and London was acquired by W R Walters CE, FSI of London and Brighton, continuing to run the practice as Chancellor & Sons". The firm came to Camberley in 1927 when an established local practice run by Richard Mack went into partnership with Mr C H Nicholson and Mr P Bowen, who had offices Ascot and Sunningdale, and traded under the name of Chancellor & Sons. This partnership only lasted for a few years, and when dissolved Messrs. Nicholson and Bowen commenced trading under a similar trading name of Chancellors & Co. This name continued until the early 80's when the business was sold to Hogg Robinson Travel during the period when banking and insurance conglomerates were buying out estate agents. Richard Mack stayed independent and continued to run the firm from his existing office at 47/49 High Street and retained the name Chancellor & Sons. 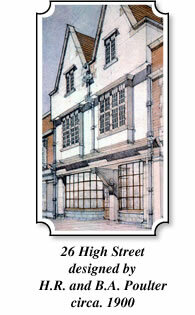 Due to the expansion of the practice, the current office at 26 High Street was established in 1945. For over 12 years the two offices ran in conjunction with 47/49 High Street concentrating on auctions, and 26 High Street on residential lettings and sales. With the death of Richard Mack in 1957 two of his staff, Arthur Allen and Maurice Eldrid, took over the business. 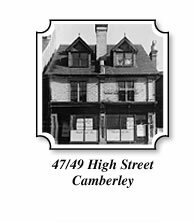 At the same time, the decline of the army presence in Camberley and the reduction in property auctions, the premises at 47/49 High Street were sold and the practice consolidated into 26 High Street in 1958 although it still had 16 staff. Seven years later there was a further change when Arthur Allen died and for four years Maurice Eldrid ran the practice as a sole trader. In 1968 George Scott, who had joined the firm as the office junior in the early 1950's delivering post, was granted a partnership by Maurice Eldrid and they worked together for 10 years until the latter's death in 1979 when George Scott became the sole owner. The business expanded rapidly during the 1970's & 1980's with the construction of the M3 Motorway, large housing developments on Heatherside, Yateley, Little Sandhurst and other areas within Camberley and the pedestrianisation of the town centre shopping area. George Scott maintained growth in the business and was able to preserve the firm's independence during the boom years in the 1980's. With the skills and reputation developed covering all aspects of residential and commercial sales and management, it was also able to survive the property recession in the early 1990's. Just as the market was beginning to flourish and the firm prosper again, George Scott unexpectedly died in 1996. Chancellor & Sons, Camberley has now moved into a new era but still with only its fifth owner in 80 years. Gordon Hignell, who had worked with George Scott for 19 years, took over the practice and with his ownership; Chancellor & Sons again became Chartered Surveyors. He is continuing to provide the traditional level of professional service and independent advice that residents and businesses have come to expect from Chancellor & Sons over two centuries.